The ghost or spirit calls himself “WRIGHT”. He shows signs of erudition and intelligence, writing many of his messages in Latin. 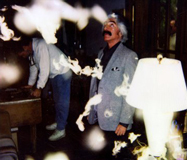 The ghost first appeared on film in March 1992 after one of the residents kept hearing unexplained noises throughout the house. 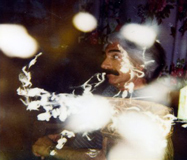 After a door opened mysteriously, he took a series of photos, several of which revealed a classic ghost-like shape, including dark shadows at the eyes and mouth. 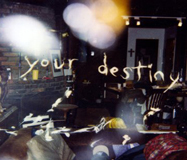 The messages began to appear on film in June 1992. 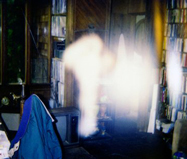 The first was in response to a friend’s question about the ghost, “Is he here now?” The photo revealed a barely discernible “yes” in cloudy white shapes. After that, the writing became far more legible. These startling photographs challenge perceptions of reality and art. 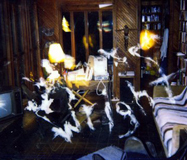 Is the image of the room with the ghostly writing the way we see ghosts, or is it the way ghosts see us? 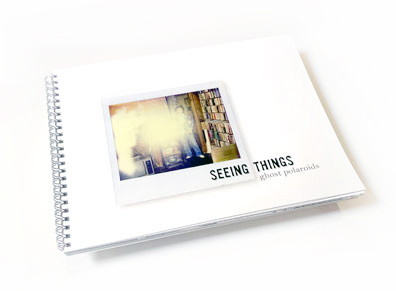 Who is seeing things, after all? Come explore these strangely surreal photographs and decide for yourself.